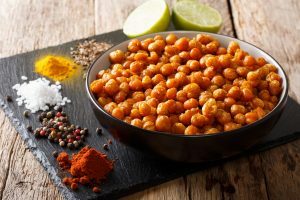 Chickpeas (Garbanzo Beans), boost intestinal health, are a fiber rich food…providing a feeling of fullness. They make a great snack as well! They also help women with hormonal balance. This recipe includes turmeric….great for gut and inflammation! Combine all spices. Any remaining mixture can be stored and used as a rub for meat and poultry. In a bowl, combine chickpeas with the oil. Add 2 Tbsp of the spice mixture and salt. Spread the peas in one layer on the cookie sheet or shallow roasting pan. Place in oven, back until golden and crisp…about 30-40 minutes. Let cool to room temp. Add more salt and pepper to taste.